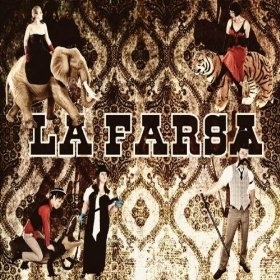 La Farsa’s visual packaging, replete with feather boas, top hats, elbow-length gloves and evening gowns, when paired with their survey sample of twentieth-century musical styles that includes soul, blues, doo-wop and a strange type of Balkan-gypsy minstrel-show thing going on, speaks for a band born in the wrong century. La Farsa seems like it would be much more comfortable playing in some bawdry cabaret under the thick pall of cigar smoke than headlining the Urban Lounge. With this said, La Farsa are at their best when they keep the twenty-first-century influences out of their music. There are moments when a strange combination of Indigo Girls and The Decemberists intrude on the distinct Victorian vibe they have established, but the rest of the album is wholly pleasant. Violins swoon, handclaps abound, flamenco flourishes are plentiful, plus Flora Bernard’s soulful croon will put hair on your chest. Ye be warned.